The complexity of modern medicine requires high performance teamwork to ensure quality care. Inpatient medicine floors in the U.S. are organized around the point of care and are fluid with members moving in and out of patient care teams. Teams rely on communication patterns that are replicable and efficient. 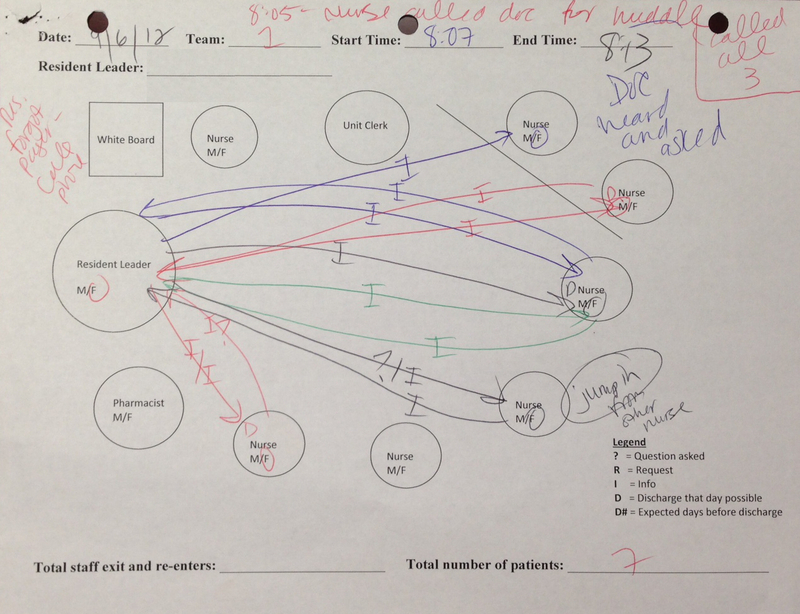 The aim of this study was to (a) assess communication within structured huddles on an inpatient medicine unit by evaluating who talked and to whom and what types of communication took place during each interaction throughout the huddle and (b) explore participants’ perceptions of the huddles. The dynamics of these huddles were studied using sociograms. Themes emerging from sociogram data were triangulated using focus groups. This project presents a novel method for evaluating teamwork dynamics in interprofessional huddles and characterizes what actually happens during information exchange at the point of care. The project also serves as task analysis for how well-designed technology can help support huddling behavior while reducing logistical challenges. With guidance from my mentor, Dr. Kimberly Hoffman, we developed the research design and obtained IRB approval. Next, I observed three team huddles for two days to create and refine the sociogram. Then, using the sociogram, I observed three team huddles each day for 16 days yielding 48 completed sociograms. I completed reflective field notes at the end of each observation with the purpose of identifying patterns and points of clarification. Data from completed sociograms was used to analyze the most frequent types of interactions among team members. To triangulate observation data, we conducted two focus groups with huddle participants–one with residents and one with nurses. I drafted the focus group protocols and transcribed the group interviews in real time. I used transcripts to conduct a content analysis and identify themes. I serve as lead author of the manuscript. Manuscript in final stages–submitting to the Journal of Graduate Medical Education soon. University of Missouri School of Medicine recently launched a re-evaluation request system that moved an idiosyncratic paper process to a streamlined online system. I used a situated action approach to design and actively participated in the re-evaluation request process for one year to identify the “embodied actions” of the actors facilitating the process. The purpose of the usability study was to: 1) evaluate the usability of the most complex interface of the web application—the administrative interface and 2) pilot faculty and student satisfaction surveys. Five potential users participated in the usability study and faculty (n = 5) and student (n = 3) stakeholders completed pilot surveys. Usability study results were categorized as content to include in a training tutorial and/or program enhancements. Survey analysis indicates faculty users are satisfied with the application and student users have confusion regarding the re-evaluation process. As principal investigator for this usability study, I drafted the IRB application, drafted testing protocols, recruited and scheduled usability testing participants, observed usability testing sessions, drafted and created surveys in SurveyMonkey, sent survey invitations to faculty and student participants, and compiled and categorized results. Transitions of care from different care settings have been a focus of recent research due to concern for errors from the increased number of handoffs as well as other factors. However, there is little research about the transition that occurs in the primary care ambulatory clinic when residents graduate. The purpose of this project was to implement a transition of care process and evaluate a checklist created to guide family medicine residents when writing a transition of care note in the patient’s medical record. We developed a transition of care process in which residents and their nurse partners utilize a transition checklist to write a transition of care note in a patient’s medical record. We piloted the process and used participant feedback to revise the checklist. Next, we created a 9-member physician expert panel from varying specialties to evaluate the checklist and sample notes from the pilot. Focus groups were conducted with the expert panelists and qualitative analysis of focus group transcripts was used to identify the most salient elements of both the checklist and sample notes and identify any missing content. Results were used to improve the transition of care checklist. This project also serves as task analysis for potential implementation of the transition of care template in the patient’s electronic medical record. I worked with the principal investigator, Dr. Kristen Deane, to formalize the research design and draft the IRB. I drafted the focus group protocols, co-facilitated focus groups, and oversaw qualitative analysis of focus group transcripts by a research assistant. I drafted the methods and results section of the manuscript. Manuscript in progress–submitting to the Journal of Graduate Medical Education soon. Hoffman, K., Hosokawa, M., Royse, L., Dyer, C., Higbee, D. (2012). Will our students be able to care for granny? Developing geriatric cases as objective structured clinical exam (OSCE’S) to assess third-year students’ knowledge and skills in delivering patient centered geriatric care. Presented at the Central Group on Educational Affairs Regional Group of the American Association of American Medical Colleges. St. Louis, MO (March 29-31, 2012). Royse, L., Warne-Griggs, M. (2016). Writing Learning Objectives and Identifying Results. Presentation and workshop presented at T3 Train the Trainer: Faculty Development in Interprofessional Team-Based Care Series. Sponsored by the Josiah Macy Foundation. Columbia, MO (September 12-13, 2016). Hoffman, K., Royse, L., Warne-Griggs, M. (2016). Writing Learning Objectives and Identifying Results. Presentation and workshop presented at T3 Train the Trainer: Faculty Development in Interprofessional Team-Based Care Series. Sponsored by the Josiah Macy Foundation. Columbia, MO (January 25-26, 2016).